Tranquility starts in the landscape, but such an Arcadian setting might be misleading. The fantasy landscape of fig. 9 was given as an illustration in Bartholomaeus Angelicus’ book ‘De proprietatibus rerum’ and printed in 1495 in Westminster. The encyclopedic book, translated as ‘All the Proprytees of Thynges’, was originally conceived in the thirteenth century. The strong lines of the woodcut give the picture straightforwardness without any symbolic reference. Lumps of rock and the occasional tree point to a certain type of landscape in the mountains. No human interference is visible. The picture is intended for those who have never been in such an environment and its sole intention is ‘encyclopedic’: drawing attention to reality. Fig. 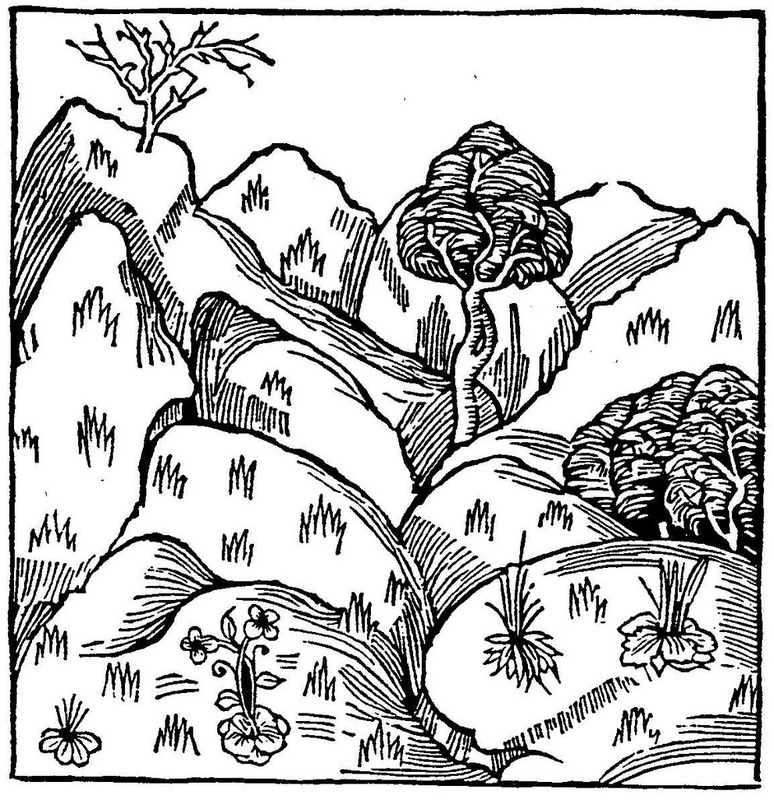 9 – Phantasy landscape of Bartholomaeus Angelicus (13th century) given as a woodcut in ‘All the Proprytees of Thynges’, printed in Westminster in 1495. The picture has no other intention then to show a mountain landscape, without further romantic or symbolic meaning. A non-descriptive landscape in black and white gets a different meaning in the hands of a mentally handicapped patient (fig. 10). A farmhouse with seven trees is not as innocent anymore, despite its rural setting. The trees, which number might have a symbolic meaning, act like the bars in a prison. Another powerful feature is the behavior of the lines themselves: they change at every crossing from white to black and vice versa, leaving a checkered impression. It is only in the foliage, hanging like dark clouds in the sky, that this oppositional game ends. Fig. 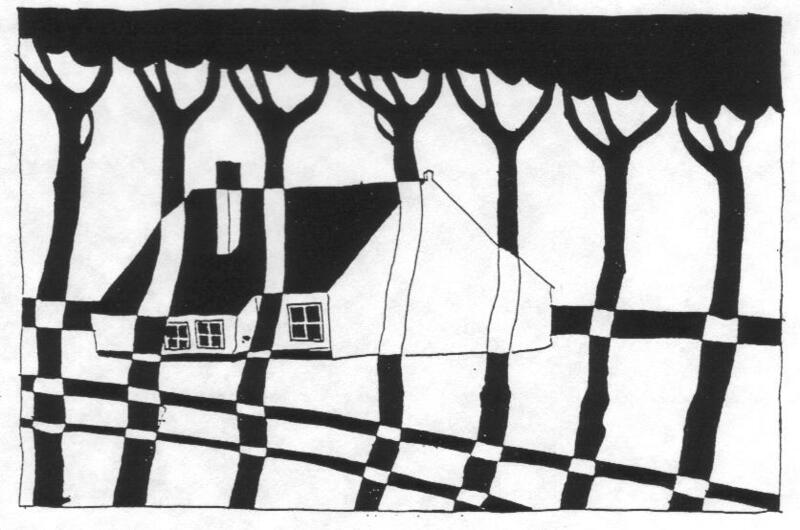 10 – View of a farm with seven trees, as drawn by a schizophrenic personality. A characteristic quality of such a mental disposition is the inability to escape the two-fold way of thinking. The schizoid (or border-line) personality is unable to think in a wider frame of mind. The black-and-white patterning enhances this tendency. The seven trees in the countryside evoke a feeling of bars in a prison. Nature as a source of inspiration has been a steady companion of all types of art, from the cave paintings in Altamira to the present day. The deep-seated idea that men are an inextricable part of nature is reflected in the approach to building, either conscious or unconscious. A ‘scene satirique’ was already depicted by Jean Martin in 1547 (SZAMBIEN, 1986), pointing to the power of a natural environment. The great devotion towards the ‘primitive hut’ started with the French Rationalists of the eighteenth century. Jean Jacques Rousseau (1712 – 1778) set the stage with his prize-winning essay ‘Discours sur les sciences et les arts’ (1750) in which he praised the savage state of mankind and proclaimed a ‘back to nature’ program (fig. 11). Fig. 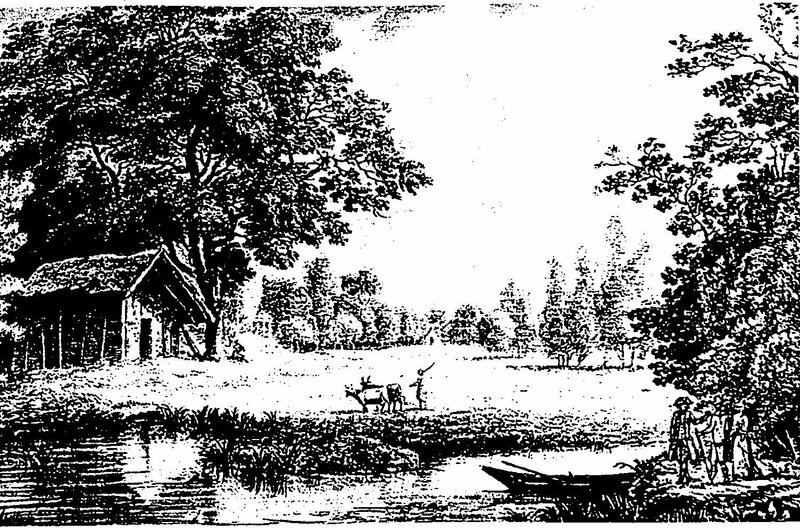 11 – This ‘romantic’ illustration, by Rene de Girardin in his ‘Promenade ou itineraire des jardins d’Ermenonville’ (1788), gives a view of an Arcadian meadow in Ermenonville. It celebrated the true and natural state of the countryside. The idea of the hut as an architectural feature is much older. Filarete, in his ‘Trattato d’Architettura’ (1470), illustrated the erection of a hut, which he found in Vitruvius’ books on architecture and Francois Blondel showed, in his ‘Cours d’Architecture’ (1675), a reproduction of a hut, which emphasized the transformation of wooden parts into stone part, just like Vitruvius. The Arcadian landscape became a sort of dream, which fitted in the early romantic outlook. Life was envisaged as in a paradise, with very little interference from the wicked product of mankind itself. Buildings had to blend into the landscape, built from natural products. The Arcadian ideal can be seen as the last effort to put Nature in an oppositional framework: to see Nature in its pure and natural state, not spoilt by human activity. The frontispiece of the second edition of Laugier’s ‘Essai sur l’Architecture’ (1755) consisted of an engraving by Charles Eisen. It shows a hut with a seated woman in the foreground, the personification of Architecture. The hut is envisaged as a natural structure, not four man-made posts, but four trees – still rooted in the ground – mark out the corners of the first dwelling. The significance of this setting as a proof of a possible four-fold orientation – like the four corners of the earth in old Egyptian times – is questionable, but cannot completely ruled out. It is, without doubt, an expression of an early ‘romantic’ mind, in the same spirit as Jean Jacques Rousseau. The cultural current of Romanticism, with its greatest heights in the early decades of the nineteenth century, does have a relation to the four-fold way of thinking in so far as it favors the senses. Feelings are important elements in a communication. These typical human expressions are associated, in a quadralectic setting, with the visible invisibility (of the woods-and-the-trees-type) of the Fourth Quadrant. It will come to no surprise, that the ‘Romantic Movement’ became an object of study throughout the nineteenth and twentieth century. This terrain, soon claimed by a new study called psychology, proved very fertile. The Vienna-born Sigmund Freud (1856 – 1939) made many valuable observations, but his mind dwelled mainly in dualistic-oppositional spheres. His subsequent psychoanalytical findings were mainly based on conclusions drawn from sexual aberrations and power conflicts. His colleague Carl Jung (1875 – 1961) was able to cover a wider mental field by leaving – at least at times – the oppositional frame of mind. A good example is his enquiry into ‘psychological types’ (JUNG, 1921/1967). The medical man (Hippocrates and Galen) had long known the subject in their theory of the temperaments, based on the four ‘humores’. It was thought that a disturbed balance between the four types of bodily fluids (blood, yellow and black bile and phlegm) could cause illness. A certain pre-dominance of one of the four ‘humores’ resulted in four temperaments or character types: sanguine – choleric – melancholic – and phlegmatic. Fig. 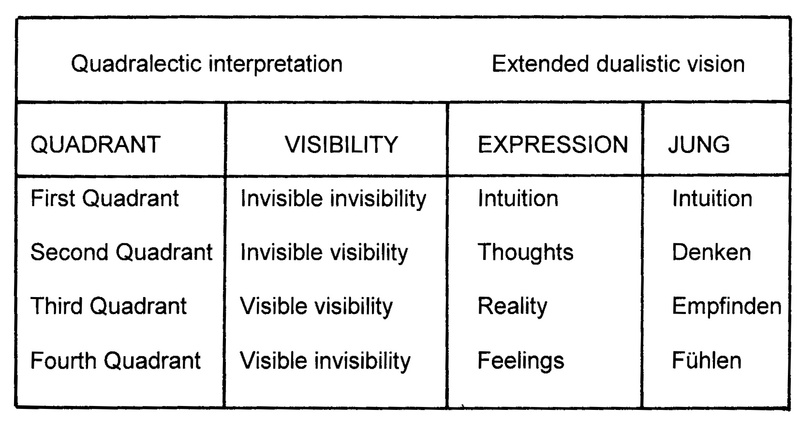 12 – An interpretation of Jung’s psychological types and main ways of expression (right) in relation to the types of visibility in the various (quadralectic) quadrants expressed in dualistic terms (left). Katheryn Briggs and her daughter Isabel Meyers (1897 – 1979) carried out a practical application of Jung’s psychological types. They added another set of ‘oppositionals’ to the extroversion-introversion (E-I), sensing – intuiting (S-N) and thinking-feeling (T-F) poles (dualities) of Jung, namely the judging and perceiving dimension (J-P). They arrived in this way at sixteen archetypal personalities. The predominance of one of these types of expression determines the psychological type. The arithmetical handling of the initial four dichotomies has similarities, in a numerical sense (16), with the deflection points of the quadralectic procedure. The genetic history is, however, totally different. The Briggs-Myers Typology – of personalities – resulted in a Myers-Briggs Type Indicator (MBTI), a practical tool to determine a ‘type’, which was further popularized by KEIRSEY & BATES (1984). A questionnaire gives the effort a (pseudo) scientific appearance. The relevance to architecture might be far fetched here, but it should be kept in mind that the observer (of buildings) is a ‘psychological type’ in its own right.